London may be the design capital of the UK, but when it comes to manufacturing... well despite the economic downturn, quite a lot of it still goes on in the Midlands. Since that's where I live I'm always happy to have the opportunity to share stuff that's designed and made in the region here on Design Hunter. In recent years Birmingham has tried to shy away from its image as a metal bashing heartland and has attempted to reinvent itself in an altogether glossier light, but in my own view this approach is sometimes misguided. It's the city's industrial heritage that gives it its unique character and this is something that should be celebrated, not skimmed over. Father and son team Peter and Charles Bowles, the people behind Original BTC and Davey Lighting, have just launched a new furniture brand Bowles and Bowles inspired by this heritage. 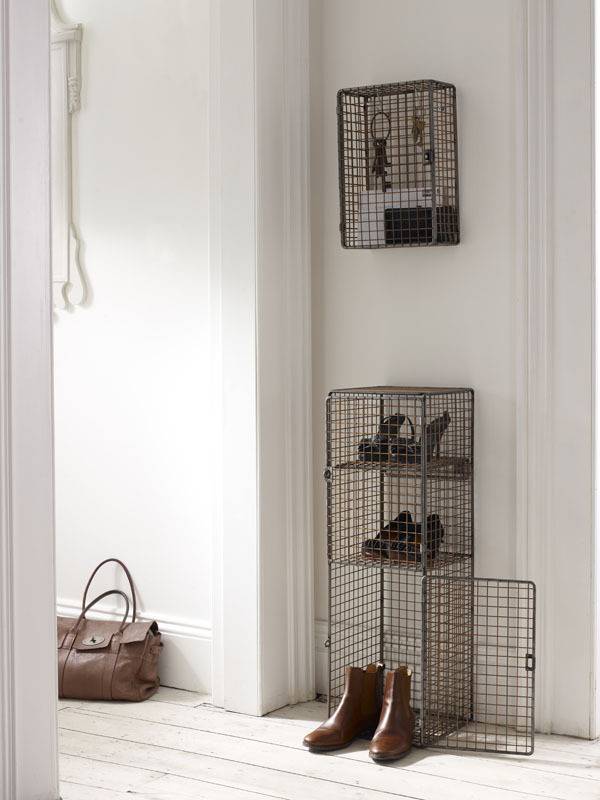 After acquiring a Birmingham metalworking factory on the brink of closure as a production facility for their lighting components they were immediately struck by the clean lines and solid construction of its original 1920s wire mesh lockers. Seeing the factory's mesh-making capabilities and expertise provided a starting point for a new furniture and multi-functional storage range which includes adjustable shelves, lockers and shoe and wine racks. Accustomed to producing wire mesh in rough form for industrial use, the Birmingham metal workers are now maximising their skills, making painstakingly constructed and beautifully finished pieces from zinc and weathered copper. Each piece is pressed, welded and folded by hand using the factory's antique machinery and tools. I'm sure I'm not the only one who finds it heartening to see traditional manufacturing being reinvigorated in this way. I've collated some of my previous posts about design made in the Midlands here if you'd like to take a look.